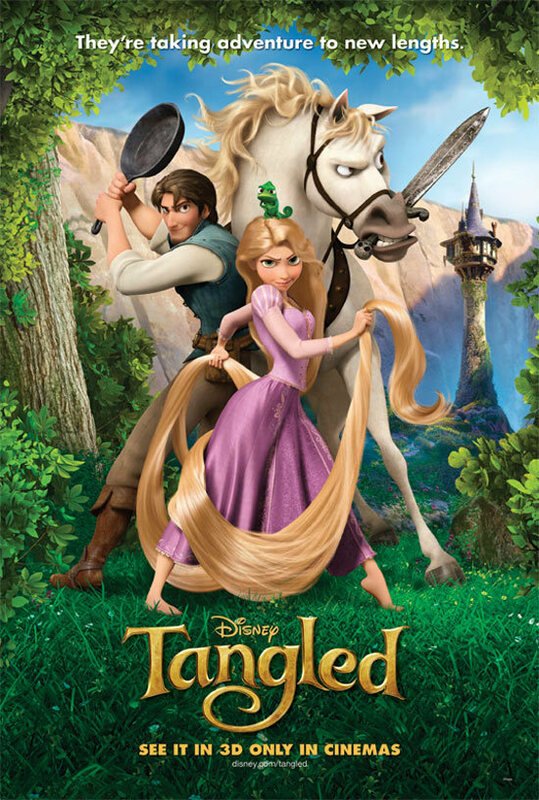 Bina007 Movie Reviews: TANGLED - lovely! So the first thing to do is forget the Brothers Grimm tale of Rapunzel, the peasant girl taken by the witch next door in exchange for the herbs that saved her mother's life. Locked in a tower as she reached puberty, Rapunzel was knocked up by a passing Prince, enchanted by her voice, but cast out by the witch in disgust. Of course, there was a happy ending. The Prince, blinded on thorns by the scheming witch, wanders into Rapunzel, who's tears of sadness heal his sight, and he takes her to be his princess. Naturally, in Disney's version of the tale, we can't have a naive girl fall pregnant, and we can't have something as simplistic as true love conquering blindness. Moreover, in the post-modern, post-Shrek age of animation, we have to play up the modern social angle. Rapunzel is now a captured Princess who falls for a commoner (just as in SHREK and THE KING'S SPEECH - what is with it Hollywood's obsession with royals falling for commoners?) and while the teen rebellion survives, it is now cast less as a tale of hidden puberty than of fighting for independence from an over-bearing manipulative mother. Rapunzel is less a fairy-tale than an animated version of THE FIGHTER! (Not to mention the fact that she really can handle herself!) Every musical number borders on pastiche - from Riverdance style folk dances, to Mother Gothel's Big Momma Morton inspired "Mother Knows Best". There are quotations from cinema, there's teen-angst slang, there's "talk to the hand" attitude from the side-kick comedy chameleon. Basically, this movie may be a fairy tale about an innocent girl, but it's very very knowing indeed. Still, for all that, I rather enjoyed it! Mandy Moore's Rapunzel is charming; Zachary Levi's handsome commoner, Flynn, is very witty; Donna Murphy's Mother Gothel is absolutely brilliantly manipulative, and I simply LOVED the blood-hound horse, Maximilian! There was annoyingly modern verbal humour, yes, but even better, good old-fashioned slapstick humour and a wonderfully old-fashioned visual look to the film. It may have been made on computers, but it feels a lot more painterly than recent films, and has the lush colours, deep woods and medieval castles of SNOW WHITE. The 3D added nothing, and some of the songs were soupy, but overall, TANGLED was well worth watching. I was genuinely engaged by the movie, and moved by its ending. So, after the serious mis-step with BOLT 3D, and the side-track into the American dream with THE PRINCESS AND THE FROG, I can honestly and gladly say that Disney is back to what it does best: fairytales. Beautifully drawn, moving, funny fairy-tales. TANGLED was released last year in the US, Canada, Israel, Kazakhstan, Malaysia, Russia, Singapore, Indonesia, Italy, Mexico, Poland, Venezuela, Belgium, Egypt, France, the Netherlands, Switzerland, Hungary, Kuwait, Bulgaria, Austria, Germany, Portugal, Slovakia, Ukraine, Australia, Turkey and Chile. It was released last month in Croatia, Argentina, Greece, New Zealand, Brazil, Panama, Romania, Serbia, Peru, Estonia, Iceland, India, Slovenia, Ireland, Lithuania and the UK. It opens this weekend in Denmark, Hong Kong, Taiwan, Norway, Spain and Finland. It opens on February 11th in Finland and on March 12th in Japan. It has been nominated for an Oscar for Best Original Song.